At West Creek Conservancy, we love doing our part to make Cleveland the best location in the nation! We are proud to serve you – the people of Greater Cleveland – and honored to earn your support. That support has fueled tremendous projects in greenspace protection, habitat renewal, and the connection of lands and parks to neighborhoods throughout our community. We are happy to say that your support has also propelled West Creek Conservancy to its 20th anniversary. 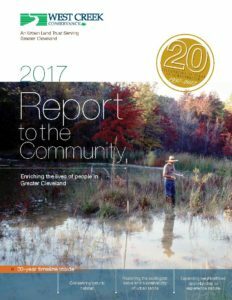 In this 2017 Report to the Community, we highlight for you our conservation accomplishments of the past year as we continue making nature your neighbor.